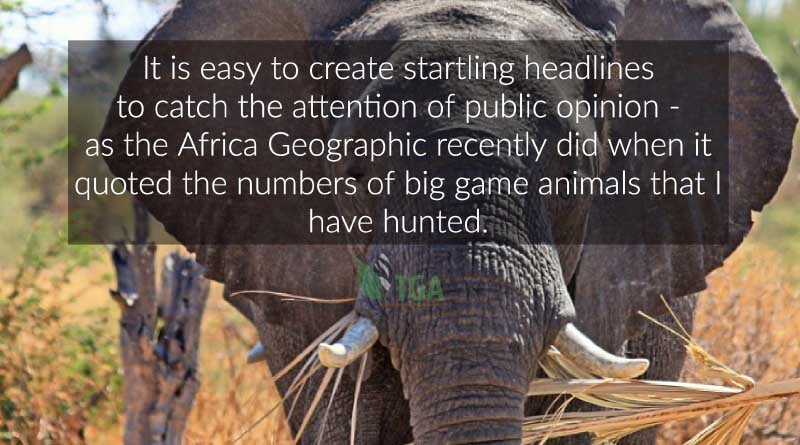 It is easy to create startling headlines to catch the attention of public opinion – as the Africa Geographic magazine published online and shared on Facebook recently did when it quoted the numbers of big game animals that I have hunted. And it left the question hanging: ‘Just why did I hunt so many?’ In the face of the public’s apparent acceptance of the untrue statements that are being made in self-serving animal rights propaganda – that the elephant is facing extinction – it is par for this magazine’s course that it chose, recently, to project a very negative anti-‘best-practice’ management stance on this important issue. I am not surprised. The magazine’s Facebook team reported that I have killed, inter alia, 5000 elephants and it infers that this is a diabolical setback for Africa’s wildlife in an age where the elephant is “endangered” and facing extinction (which is absolutely not true) and where every elephant should be protected from all harm. NB: I stopped hunting elephants in 1983. The relevance of this criticism, therefore, is well passed its ‘sell by due date’ limitation! But let us continue anyway. I don’t want to miss out on the opportunity this ‘personal crisis’ has to offer! It gives me the chance to tell the truth that has not yet been divulged. 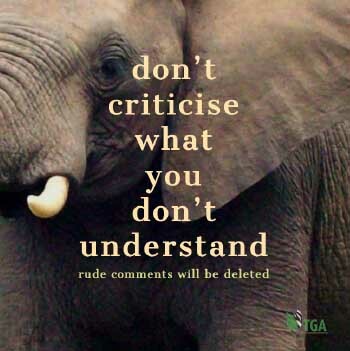 They stated their disapproval of my elephant management suggestions for Kruger National Park – which is their prerogative – and they have supported the “landscape management plan” which is now in force in Kruger – of which I have publicly disapproved. I fully understand that their public exposure of my elephant management history is a blatant attempt to vilify my reputation. I expect no other treatment from Africa Geographic because the magazine is a major mouthpiece for South Africa’s animal rights brigade – my implacable enemy. I don’t deny one single item on their list of my supposed ignoble history. Indeed, if I had a mind to do so I could add greatly to the environmental crimes that I am purported to have committed. Nevertheless, I would like to use this opportunity to advise the readers of the Africa Geographic Facebook – and everybody else in South Africa’s public domain – of the greater realities surrounding this attack on my person. It actually worries me not at all. The big game hunting figures quoted (and more) were accrued over my 24 years as a game ranger/game warden/provincial game warden in the service of Rhodesia’s/Zimbabwe’s Department of National Parks and Wildlife Management. Not one of those animals was shot on licence. They were all killed in compliance of my big game management obligations to my country’s National Conservation Strategy (NCS) – which, like South Africa’s NCS, is based upon the IUCN’s World Conservation Strategy (WCS) 1980. And the reason why Rhodesia/Zimbabwe’s and South Africa’s NCSs are based on this same protocol, is because, in 1980 – when the WCS was hailed as being the blueprint upon which man and nature would progress into posterity in symbiotic harmony – all responsible nations obligated themselves to model their NCSs on the WCS template. Africa Geographic seems not to have heard of this state of affairs – or they deem it to be irrelevant. In all the rhetoric used to besmirch my reputation, not one single reference was made to the fact that the primary purpose of a national park is to maintain its endemic species diversity; and no concern has been expressed concerning the fact that the current landscape management plan for Kruger National Park is causing massive species losses of both plants and animals. This is happening despite the fact that, for a very long time, SANParks has been mandated by parliament – above all else – to maintain the species diversity of its national park estates. Wildlife management in a national park is the practice of establishing and maintaining a sustainable, healthy and generally dynamic balance between the soil, the plants and the animals in the sanctuary’s ecosystem. It is not species specific – and it certainly has nothing to do with giving one species preferential consideration over any other. Honest management is imperative! When one herbivorous animal species exceeds the carrying capacity of its habitat – and it starts destroying its own habitat – it should be understood that it threatens the existence of every plant species, and every other animal species, in the sanctuary. The remedial action should be to reduce the numbers of the excessive animal population to a level that the habitats can once again sustainably support. How more simple can this equation be? I have never been a trophy hunter. During the 1960s and 70’s I was a ‘management hunter’ for the government department that I worked for. I killed hundreds of crop-raiding elephants; and many more for other legitimate reasons. I excelled at whatever I did and I killed elephants, when it was necessary to do so, with lots of exhilaration but no emotion. I was not the only game ranger in the department to reach such heights of excellence. During my career the department killed 44 000 elephants in the same period of time; and comparatively few game rangers were involved in the programme. Those who were each shot many thousands of elephants. Only the best persisted because they achieved the most desirable results. We all killed quickly and humanely causing minimal disturbance to those elephant herds that we left completely untouched. The hunting of 5000 elephants for legitimate management reasons should not be looked upon as an indictment but rather as a manifestation of the great extent of my involvement with elephants and their management over a very long period of time. For 24 years I was steeped in elephants, their management implications, and their hunting. They became part of my psyche. And when I think of elephants all their management needs come oozing out of my soul; and the implications of having elephants in a national park are second nature to my being. The criticisms that the African Geographic Facebook article invoked are of no consequence to me. I look upon them as the sad manifestation of a society that is drawing ever further away for the realities of nature – pushed in that direction by articles such as the one here under review! But I noted that there were many responsible commentaries that see my point of view, too. THAT is encouraging. They indicate to me that responsible and intelligent people in South African society are starting to think this conundrum through. Compared to my history and what must be obviously my great affinity for this iconic animal, I ask the African Geographic Facebook team what kind of credentials they have to offer to justify their negative attack on my elephant management perspectives? They have no experience to compare with mine! And THAT begs the question: Just how much credence should the public give to the Africa Geographic magazine’s editorial opinions about ANY controversial conservation issue? Unless they want to be led by the nose all their lives, therefore, its readers should become critically independent thinkers. And they should take the trouble to consider that if they continue to give support for the elephant’s preferential treatment in Kruger National Park today, they will be enabling the destruction of this country’s greatest single reservoir of terrestrial biological diversity. And THAT is the bottom line. I would like to understand what it is that these animal rightists gain from been so ignorant to the fact that the land can only sustain a certain number of elephant especially because they are very destructive feeders, and why do unqualified people make stupid comments when they do not even contribute to conservation. The conservation of our parks soil all the animals and the plants is the most critical of actions that we as the superior race ( the humans ) are the custodians of must ensure the survival of all the animals and plants. I would like to see a penalty imposed on stupid comments from unqualified people. You must accept that animal rightists are fraudsters, racketeers, and part of organised crime. The big animal rightists NGOs are “in it” to make money – nothing else. So don’t mislead yourself by thinking they are “misled”. They are NOT “stupid”. There is a purpose in everything that they do – and that purpose is to make money.